- The Gertbot brings electric power to your computers. It has four channels each capable of driving 30 Volts and 2.5A. It can drive capacitive or inductive loads. Besides the four H-bridges the boards also has two open drain N-MOSFETS which can sink 3A at 30Volt. - The primary target is driving motors. Stepper motors, brushed motors and other robotics, however it can just as well be used to control other equipment where a lot of electrical power is required. For example one channel can drive 10.000 LEDS. Use three channels for RGB and combine that with the build-in PWM controller: you have mood lighting for a whole building. Anything which requires between 8 and 30V and up to 10Amp it can drive it! Altough the board plugs on top of a Raspberry-Pi it can also be used standalone and controlled from Windows or any other computer with a serial port. 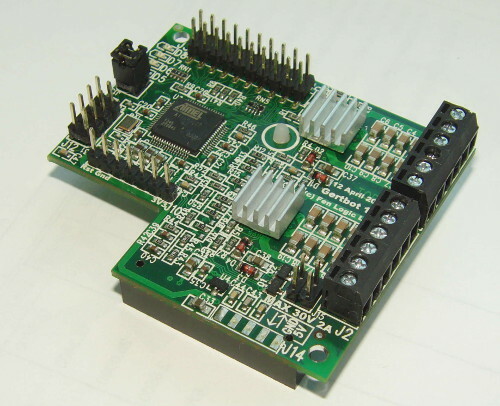 - The board comes with a lot of software all of it provided with full source code. It has a debug and control GUI which runs under Linux or Windows. It has C-drivers, Python drivers and numerous example programs. But you can also control the board without programming. See the video on the examples page. - There is a micro controller which takes care of the signal timing, thus leaving your computer free to work on other things. PWM from 10Hz to 10KHz. Precise signal generation for stepper motors as slow as one step every 16 seconds, or as fast as 5000 steps per second. There are inputs which can be connected to switches which stop your motor, without any help from the Raspberry-Pi. It is all taken care of. - Four brushed motors or two stepper motors is not enough? Just plug in more boards. The system can be expanded up to four boards. That gives you sixteen brushed motors or eight stepper motors or any combination in between. More current? You can switch bridges in parallel giving you two 5A or even one 10A output. - The outputs are short-circuit and thermal protected. Which means you really have to try real hard to blow them up. (I tried and I have not yet succeeded). What is more: the system can be set-up to stop other motors when one of them fails. Thus no fear for half your system stopping and the other half causing havoc. - The board can generate DCC signals, a protocol used to control model trains. With four independent channels and 2.5A per channel you can control an awful lot if tracks, trains, points and signals. A demonstration GUI controlling three trains, four points and two signals is available. Again complete with source code.